Israeli occupation forces assaulted a number of participants in al-Masara weekly demonstration protesting against the Apartheid wall and settlement on Friday morning. Photographers, who were covering the protest, said that Israeli forces brutally assaulted some of the protesters in the march, including journalists. 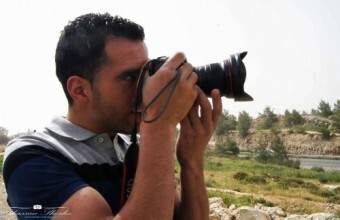 Israeli soldiers assaulted Abdul Rahman Younes, a photographer and correspondent at al-Quds.com newspaper, before arresting him. It’s worth mentioning that al-Masara march is one of the weekly demonstrations that take place every Friday to denounce the practices of the Israeli occupation, especially the Apartheid Wall and the settlement expansion in areas south of Bethlehem.